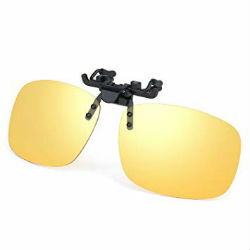 Yellow and Rose clip-ons are effective in reducing harsh blue light, reducing glare and increasing contrast in low light conditions. Flip-up clip-ons clip securely clips to the top of your plastic or metal frame, providing 100% UV protection. Flip-up clip-ons provide the convenience of flipping them up or down or quick and easy removal.